The San Diego University for Integrative Studies is the home of the Consulate General of Brazil. For the last 19 years, three times a year for two days the staff of the Consulate General of Brazil in Los Angeles provide consular services at the San Diego University for Integrative Studies. The Consulate General in Los Angeles has responsibility over the following counties: Imperial, Kern, Los Angeles, Orange, Riverside, San Bernardino, San Diego, San Luis Obispo, Santa Barbara, and Ventura. The San Diego University for Integrative Studies psychology and marriage and family therapy students volunteer their time at Counseling Centers, Psychiatric Hospitals and mental health facilities throughout San Diego County as part of their practical training. They volunteer at facilities offering treatment, rehabilitation, and recovery services which include screening and assessment, medication management, crisis intervention, group and individual short term therapy, for people who are experiencing persistent and severe mental illness or a mental health crisis. Services are also offered at integrated system of community-based alcohol and other drug prevention, intervention, treatment, and recovery services throughout San Diego County. In addition some programs offer case management and homeless outreach. Each year, thanks to the generosity of the San Diego University for Integrative Studies students, staff, instructors and the generous San Diego community, The Salvation Army receives thousands of new toys and gifts through the Toy Drive. The Salvation Army distributes the toys a week before Christmas in the form of a Toy Distribution -“Toy Shop”. Families and children needing holiday assistance are selected through School and Agency Referral Programs of The Salvation Army. This is a wonderful opportunity for the SDUIS and USAELC students to participate and give something back to our community. SDUIS staff, students and instructors also donate bicycles at our Annual Christmas Party. You too can help! Join us this year by bringing joy into the lives of San Diego’s needy children. Donate a toy by bringing it to SDUIS or contact us and we will pick it up, 619-297-1999. San Diego University for Integrative Studies participates in a monthly Feed the Homeless event. Our students involved take part in collecting donations, and creating and distributing over two hundred meals to the ever growing homeless population in San Diego. While involved in community service activities our students practice their conversation skills, learn new vocabulary and witness the immense need for acts of generosity and philanthropy in our community. Community service unites students from diverse backgrounds to work toward a common goal building camaraderie and teamwork. Our students learn more about themselves and our community. During our Community Cleanup event staff and students participate in locating and targeting one specific part of the community in need. 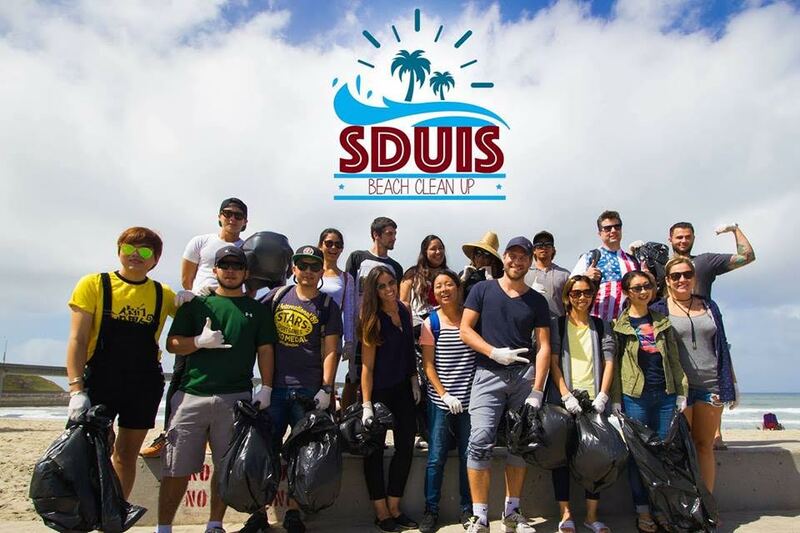 Participants of this event most recently cleaned up Ocean Beach, California. Over 20 bags of trash were collected from the beach, sidewalks, and neighborhoods, improving the location for humans and wildlife. Our most recent event held at San Diego University for Integrative Studies was our canned food, and clothing drive. Staff and students were asked to bring canned goods, and gently used clothes to help those less fortunate than themselves. Over fifty students donated to this cause and all donations were given to Father Joes Village in Downtown, San Diego. San Diego University for Integrative Studies hosts a fit camp taught by Olympian Jadel Gregorio. This event is free to visitors and allows participants to learn about maintaining a healthy lifestyle while also working out. This program is offered after office hours allowing, students, staff, faculty, and the community the opportunity to join and learn.